New Price! CARFAX One-Owner. Clean CARFAX. 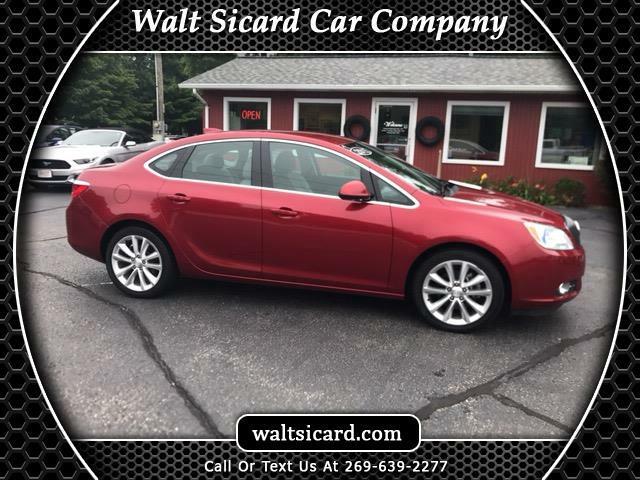 Crystal Red Tint 2015 Buick Verano Convenience Group FWD 6-Speed Automatic Electronic with Overdrive ECOTEC 2.4L I4 SIDI DOHC VVT 2015 Buick Verano Convenience Group in Crystal Red Tint, Sought After Options Include, 6 Speaker Audio System Feature, Audio System Feature, Auto-Dimming Inside Rear-View Mirror, Driver 6-Way Power Seat Adjuster, Exterior Parking Camera Rear, Forward Collision Alert, Outside Heated Power-Adjustable Mirrors, Preferred Equipment Group 1SG, Radio: AM/FM/SiriusXM Stereo w/MP3 CD Player, Rear Cross-Traffic Alert, Side Blind Zone Alert, SiriusXM Satellite Radio, Ultrasonic Rear Parking Assist w/Audible Warning, Universal Home Remote. Message: Thought you might be interested in this 2015 Buick Verano.